R.U.R. is likely the shortest book that I've read during my stroll through the classics, and I finished it very quickly. It's a three act play, originally written in Czech, written by Karel Čapek in 1921. Its claim to fame comes from having introduced the word 'robot' to the world lexicon, obviously an important milestone in genre history. But the play didn't match my expectations at all. 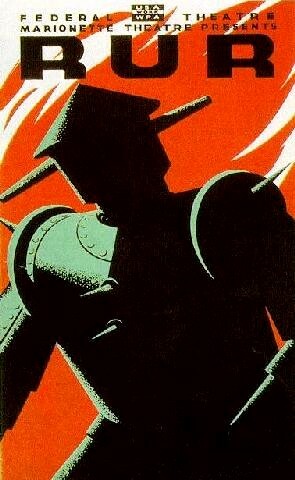 For one, the 'robot' workers of the play are biological, not mechanical, in origin. Their commanality with today's robots rests on their production by science (rather than reproducing themselves) and their lack of souls. I had assumed that 'robot' always meant machine, but not in the early days. The fact that the focus of the play stayed almost entirely on the human actors, not on the robots, was my other big surprise. Given that this is a polemical work where the robots clearly stand in for the oppressed working class, I'd have expected a little more active participation by members of that underclass. Instead we mostly get humans talking about the robots, arguing about their fate and purpose and the ethics of oppressing them. In Act 1, we get all the infodumping. Helena comes to visit the robot factory and learns all about their history in a convenient stretch of info-dumping. It turns out she's there to try to free the robots, but the manager assures her that they don't want to be free; they have no souls and will just keep working. As she's the only human female on the island, he also insists she marry him. She declines. Act 2 occurs ten years later and she's married to that guy. Yes, well. Ahem. Also, she's been influencing the resident scientists to try to give the robots more soul and personality. We get some nice anti-robot invective from the only actual working class human on the cast list, Helena's maid servant. Then the robots rise up all around the world, and proceed to kill all humans. We get this information in the typically theatrical way, in dispatches from the outside and then sounds of the uprising outside Helena's room. Histrionics ensue, in the course of which Helena burns the technical specs/schematics that show how robots are made, which should make it impossible for anyone to make more robots; including the robots themselves. In Act 3, only one of the scientists remains, and he is probably the only human left in the world. The robots are keeping him alive, hoping that he'll re-invent the technique of making more robots (they're not immortal, and in fact have limited life spans). We finally get some dialogue from the robots themselves. The scientist, half-mad at this point, starts picking out robots to dissect alive, hoping to find out what animates them. Two of the robots, a man and woman, get very self-sacrificing at this point, and the scientist diagnoses them as being in love. This proves that they've developed souls. Thus they'll be able to survive and replicate themselves from here on out. The End. As a work of literature, this was a very quick read but filled with astonishing amounts of melodrama. Of course, in today's sf the end of the world is so commonplace that we expect our heroes to act with more composure than this. But I guess when you're witnessing one of the first robot uprisings ever in literature, it's probably not yet the time to be making the 'I for one welcome our new robot overlords' joke. As a work of polemic, it certainly gets the job done with a minimum of subtlety. Although I wonder if the moral doesn't end up being: don't be nice to (humanize) the workers, or they'll rise up and kill you all. Certainly by the end Helena ends up having to shoulder most of the blame for the death of the human race, although a couple of the other characters also own up to a share. R.U.R. definitely signals the way robots will be used in the genre as it moves forward, as markers of Otherness and stand-ins for various categories of oppressed peoples. See examples as recent as Mike Resnick's Hugo-nominated short story, "Article of Faith" (Baen's Oct. 2008). And much like the earlier Pinocchio, these robots do turn into real humans at the end, transformed by the power of love. So it's interesting to go back and look at this first example of officially-labeled 'robots.' It won't take you much time and as long as you can stomach several pages of human whining, it is edifying. This is the newest tattoo, debuting at ICFA a couple of weeks ago. I put a photo of it out on Twitter at the time, but we've finally gotten the ICFA photos off our camera. So here's a high-res shot of the new art. Also: hair by Liza Groen Trombi. Not only did it look awesome, but it stayed solid the entire evening without even a drop of hair spray or gel. 2. 5 sessions, 14 hours on the table. Entire process, from talking about the art to being fully inked, took 5 months. 4. No, for now I think this is my last tattoo.